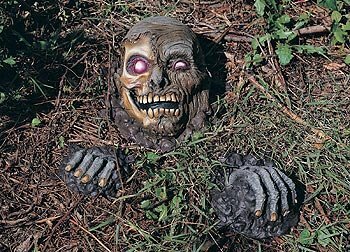 This eerie skull Halloween decoration is a realistic addition to your haunted house decorations, or a great way to add a bit of Halloween scare into your garden. Just stick the pieces into the earth a bit, and watch neighbors gasp as they walk past the zombie making his way out of the grave. Add a strobe light (sold separately) for an eerie lighting effect. Haunt your home for a party or just for fun with decor and props from the world's costume leader, Rubie's Costume Company. From standard costumes to mascot and rental quality costumes, as well as masks, wigs, accessories, shoes, and decor can all be found under the Rubie's brand. Family-owned and family-focused since 1950 and based in Long Island, New York, Rubie's brings you fun for every season: Halloween, Christmas, Mardi Gras, Easter, and all in-between.